Getting straight teeth as an adult is possible, but it’s not something most adults want to face. The idea of walking into a corporate business meeting or first date while wearing braces is an embarrassing one. So does this mean you have to choose between being embarrassed about braces or being embarrassed by crooked teeth? Not anymore. 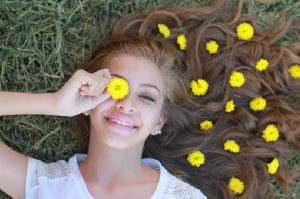 Everyone should have the smile that they dream of and not having braces as a child or a teenager doesn’t mean you can’t straighten them now in a more discreet way. How can you get straight teeth without the pain, discomfort and the eyesore of permanent adult braces? You’ll be happy to know that you can get straight teeth without anyone even knowing that you’re undergoing treatment with Invisalign®. 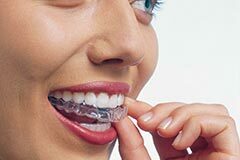 Invisalign® is an extremely effective way of straightening teeth, and its use of state-of-the-art SmartTrack® material means that you’ll enjoy results faster than with traditional aligner treatments. You’ll kick things off with a 3D oral inspection, where your dentist will scan your mouth to create a digital model of it. It will show your dentist the best possible course to take to your new and improved smile, which you can approve to allow the treatment to proceed. On approval, your doctor will have your aligners made. It’s worth noting that while Invisalign® produces results faster, it still requires time and patience. The treatment requires you to go through various courses – each slightly different from the one before. The goal is to create gradual change, with each session bringing you closer to the smile that you’ve always envisioned yourself having. Not being able to eat your favourite foods, brush your teeth or talk without a lisp is something that puts many people off having their teeth straightened or wearing an aligner. When you’re using the Invisalign®, it fits into your lifestyle and not the other way around. Maintaining good oral hygiene is as simple as removing the aligner when you need to brush your teeth, and you won’t have to worry about it staining or discolouring your teeth either. Having dinner with friends soon or attending a work conference? You’ll still be able to do everyday activities like eating and drinking without any limitations. All you need to do is remove the aligner before you begin and put it back on afterwards. At Apple Dental, we offer Invisalign® treatments, giving adults in Sydney a chance to smile with confidence. If you’re ready to change the way you feel about your teeth, contact us today. There’s nothing worse than chatting to someone with bad breath. Not only does it make for an uncomfortable encounter, but you quickly begin to question your own oral hygiene. Does your breath also smell? Would you even notice? Perhaps you should keep your distance from everyone? How do you politely ask the person to stop talking because you can’t stand the smell any longer? While we can’t help you broach that awkward conversation, we can give you a few tips to keep your own breath fresh, so you never have to worry about scaring people away. Despite playing a crucial role in maintaining your oral health, regular flossing is commonly overlooked. While twice daily brushing will clean the surface of your teeth, flossing removes trapped food particles that become lodged between the teeth. Trapped debris feeds the bacteria in your mouth, leading to bacterial overgrowth and nasty odours. To avoid embarrassment, we recommend flossing every time you brush your teeth. Oral bacteria like to colonise the surface of your tongue. Brushing your tongue thoroughly with every teeth clean ensures you are keeping bacterial numbers low, reducing the likelihood of bad breath from bacterial overgrowth. If you’re suspicious of bad breath but not in a position to brush and floss your teeth, mouth wash is an excellent solution. Mouth wash provides an all-over clean of the inside of your cheeks, gums, under your tongue and other crevices your toothbrush can’t reach. Use mouth wash both as part of your regular tooth brushing routine, and on-the-go in between meals. If you’re maintaining a great teeth cleaning regime but feel your breath is still questionable, the odours could be coming from your stomach. Taking a probiotic tablet will aid in the digestion of food in your stomach, ensuring the food is broken down quickly and doesn’t linger for long enough to cause bad breath. There are many ways that you can keep bad breath at bay during the day. If you find that the above measures aren’t helping, we invite you to make an appointment with the friendly team at Apple Dental to discuss if there are any underlying dental or oral health issues that could be to blame. The market is filled with dozens of dental products aimed at freshening our mouths, including sprays, gums, mouthwashes and drops. With so many on the go products to use, is it really necessary to brush ourteeth more than once a day? The answer is a resounding yes. No matter your age, brushing your teeth at least twice a day is crucial. There are plenty of benefits for doing so. Here are five of them. Our mouths are constantly filled with bacteria and germs that are growing and spreading. Brushing your teeth twice a day will ensure that this bad bacteria is destroyed or removed. If you brush your teeth in the morning and go the entire day without brushing again, the build-up of bacteria will start damaging the enamel of your tooth and weaken their gums and roots, allowing decaying to occur. The presence of this bad bacteria also contributes to foul breath. We produce more saliva when we’re awake than when we sleep. Why is this important? Because saliva helps build up a barrier against plaque and bacteria and prevents cavities from occurring. Therefore, brushing your teeth in the evening or just before you go to sleep assists with reducing bacteria and saliva when we’re sleeping. This reduces terrible breath in the morning by decreasing the acids that build-up while you’re asleep. Brushing your teeth just once isn’t enough to maintain a happy mouth. The reality is that the less you brush your teeth, the more damage you expose your gums too. Plaque, bacteria and tartar are detrimental to the health of your gums and can cause infections and bleeding. Our medical knowledge has dramatically increased over the years and dentists, and general medical practitioners now know that there are plenty of diseases directly related to poor oral health. Poor oral health can lead to heart disease, diabetes and osteoporosis. It’s also been linked to preterm labour and low birth weight in pregnant women. Hopefully, you’ll now understand just how important brushing twice daily is. This, in combination with annual dental check-ups, will ensure that you keep smiling and enjoy healthy teeth. Isn’t it odd that even though we know that walking under a ladder or stepping on a crack won’t cause us harm, we go out of our way to avoid doing these things? 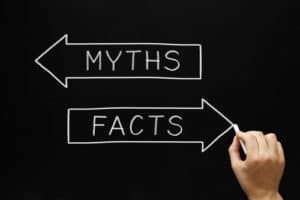 Myths are powerful influences on our behaviour – even when we know better! As dentists we’ve found that people often neglect certain aspects of their oral health due to certain ‘facts’ which are untrue. Here are the most common oral health myths we’ve encountered, debunked! Excess processed sugar increases tooth decay as when its broken down, it feeds the bacteria in your mouth, increasing damaging plaque and acids. The misconception here lies in what contains sugar. Starchy, high carbohydrate foods can be just as damaging to teeth as candy. White teeth look amazing when you’re smiling right? It definitely looks good, but this doesn’t mean it’s healthy. There might still be cavities and other oral risks you’re exposed to, so regular visits to your dentist are important regardless of the colour of your teeth. Hard bristles can do more harm than good. Soft brushes are great for children and people with sensitive gums, and hard brushing can cause bleeding and discomforts when done incorrectly. Fluoride in drinking has significantly reduced tooth decay. The Australian National Health and Medical Research Council has researched this myth extensively and found it to be false. Diet drinks still encourage the production of acids that over time can wear down tooth enamel increase their sensitivity and cause cavities and tooth loss. What’s healthier? Drinking water. With so many advancements in whitening techniques and general oral care, a whitening procedure from a professional dentist is highly unlikely to damage your teeth. Instead of following what your mates say or what you’ve heard, rather do your research. Or better yet, get in touch with Apple Dental for an oral consultation. We’re happy to debunk any myths you’ve come across. Stay hydrated: Drinking lots of water keeps your mouth hydrated. This counteracts a dry mouth as it washes away the buildup of mucus. Gargle with salt water: Salt draws mucus out of the sinuses. Gargle with a solution consisting of a teaspoon of salt dissolved in a glass of water to reduce and flush away accumulated bacteria, relieving throat pains and reducing bad breath and plaque. Treat your teeth: Regular brushing and flossing your teeth at least twice a day is important to maintain good oral health and also reduce the effects of dry mouth. Treat your allergies: Avoiding anything that causes or triggers your allergies. Treat them with prescriptions after consulting with your doctor, ensuring it has no side effects. Talk to a dentist: Probably the most effective and useful step is talking to a dentist. At Apple dental, our professional dentists can identify root causes of your oral problems. 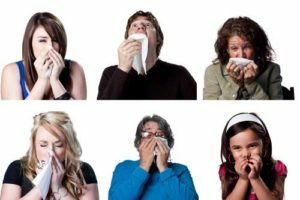 Whether its allergy-related or not, we’ll figure it out and provide the ideal treatment. Get in touch with us for a consultation if you’re experiencing any dental issues today. As the year comes to the end, many personal investments we’ve made come to fruition. While you’re busy planning your holiday and going Christmas shopping, make sure you don’t forget to lodge your health insurance claims before the end of 2018. Many Aussies forget this and assume their doctor will do it on their behalf, while others dread the process, thinking its lengthy and complicated. Whichever group you fall into, if you’re paying up to $600 a year and not reaping the rewards of this private health insurance benefit, you’re losing out on what you’ve already paid for. Here are some answers to questions you might have in mind regarding dental health fund rebates and what you need to do to get them. Although health funds are different, dental health has two main categories; general dental and major dental cover. Under the general dental cover, your allowance will pay back on items such as checkups, minor tooth extractions, oral cleans, x-rays and fillings among others. Major dental covers more complicated treatments like root canals, crowns and implants. 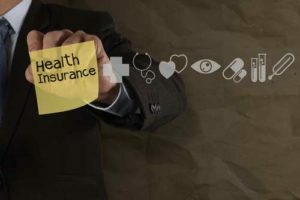 How Do My Yearly Benefits Work? Before you reach your yearly limit on general and major dental cover, checkups and cleanings are generally allowed every 6 months. Thereafter (and based whether or not your health fund operates on a financial year basis) the limit gets topped up. It’s beneficial to use the benefit of teeth checking and cleaning during the year as a preventative measure. The old saying that prevention is better than cure has never been more accurate and its cheaper and easier to treat dental issues the earlier you detect them. Our teeth hardly ever get a break. If you consider that they’re used at least 3 times a day for eating, by the time you reach your forties they’ll have been used to help break down over 13 000 meals. Maintaining oral health is crucial for this reason. You need to make sure your teeth are well-maintained regularly. Good dental health means less expensive treatments later down the line. With the festive season upon us, it’s also important that you keep the kids in mind. As everything winds down and they’re home from school, there’s not better time to take them for a checkup before 2019 gets going. To avoid toothaches and financial pains, contact Apple Dental today. 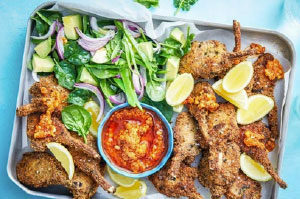 T hese tasty lamb cutlets are quick and easy to make and are perfect served with a fresh green salad. Line a large baking tray with parchment paper. Preheat oven to 180°C/160°C fan-forced. Mix coriander, onion powder and breadcrumbs in a large snap-lock bag and season. Place lamb and egg in a large bowl and toss to coat. Put the lamb in the breadcrumb mixture, seal the bag and shake until lamb is thoroughly coated. Place lamb on the baking tray and spray with oil, baking for 30 minutes or until browned and cooked through. Put snow peas in a medium heatproof bowl and cover with boiling water. Let stand for two minutes before draining and rinsing under cold water. Thinly slice peas lengthways and mix with spinach, onion and avocado. Mix together extra oil, dip and lemon juice, and serve cutlets with dip mixture, salad and lemon wedges. 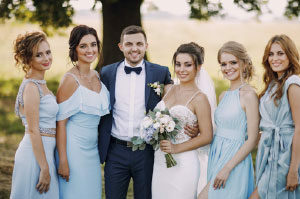 Is Your Smile Ready for Wedding Season? Wedding season is a time to smile, but do your teeth look their best? If they could use a little help, we have some easy suggestions to help your pearly whites sparkle. A professional dental cleaning is an excellent way to spruce up your smile, and it’s great for your gum health too. Ideally, everyone should have their teeth cleaned professionally at six monthly intervals. If you’re looking for something a little more, a professional teeth whitening treatment is just the thing. Choose a one-hour teeth whitening treatment in our comfortable dental office, and which will brighten your smile by several shades. Otherwise, we can provide custom home whitening kits for use in the privacy of your own home. These take a couple of weeks to achieve maximum effects. If you have always wanted to improve your smile, the wedding season is the perfect opportunity. We can custom-make beautiful all-ceramic crowns, veneers and fillings while you wait. 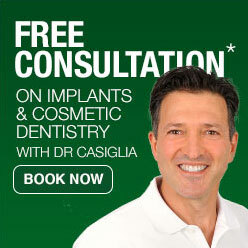 Dental implants are the most advanced way to restore missing teeth. Although treatment takes a little longer, they are well worth the effort, and you should be enjoying the results for many wedding seasons to come. Anyone who has ever put up with the misery of hay fever will dread the warmer weather. Listed below are a few ways to naturally control your symptoms this spring. Vaseline. A smear of Vaseline or another balm around your nostrils creates a barrier that can help trap pollen. Hay fever is the perfect reason to buy a new pair of sunglasses. Choose a wraparound style for more protection. Weather apps. If you haven’t already, download a weather app to keep track of pollen counts locally. This can help you to plan events and to decide when it is better to stay indoors. Quercetin and Vitamin C. Onions and apples contain quercetin, a natural antihistamine. Vitamin C is another natural antihistamine, so eat plenty of fresh fruit and vegetables. Close your windows. Your windows create a physical barrier to pollen, so keep them shut if you can and especially at night when the pollen count is often higher. Dry your laundry inside. Pollen can stick bedsheets and clothes dried outside. Drying your laundry indoors might be less convenient, but it could reduce the severity of your hay fever. Shower often. Pollen sticks to your clothes and to your hair and skin. Showering and washing your hair helps to eradicate pollen. 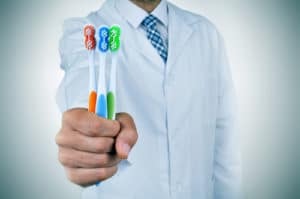 How are Oral Health and Mental Health Connected? Did you realise oral health and mental health are intimately connected? Many people are unaware of this link, and even scientists are not quite sure of the exact connection. The relationship between oral health and mental health is cyclical. People with mental health problems are less likely to look after their physical and oral health. When oral and physical health is neglected, a person is less likely to eat nutritiously or to follow healthy habits. Depression is often associated with tobacco and alcohol usage, increasing the risk of tooth decay and acid erosion. People who are depressed are less able to look after their oral hygiene and are at higher risk of developing dental disease. Bipolar disorders negatively affect dental health. The medications used to treat bipolar can cause dry mouth or xerostomia, and stomatitis. People with bipolar can overbrush their teeth, damaging gums and abrading tooth enamel. Poor dental hygiene can impact mental health in another way too. People who have lost their teeth or who have bad breath are more likely to suffer from social anxiety.